This time, on a cold morning, we took the U-Bahn until: Platz der Luft -brücke. Then we had to walk about 1 km to Tempelhof. 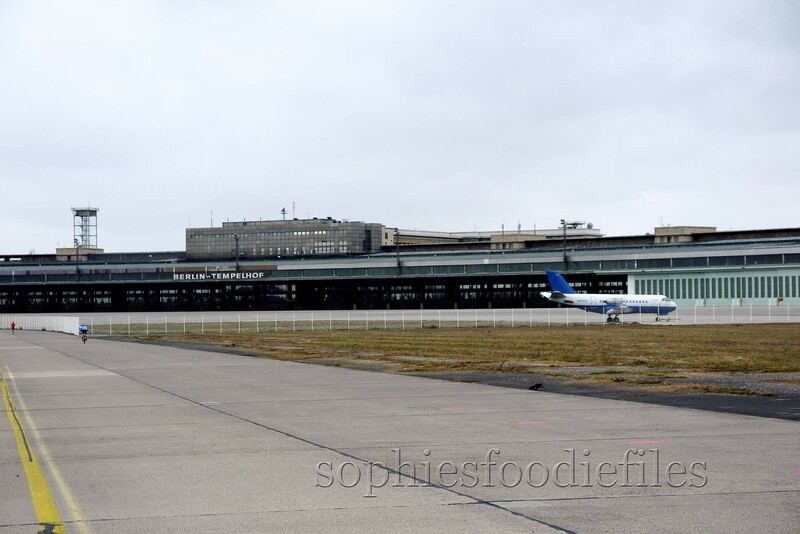 Tempelhof is an old closed airport, build by Hitler in the 1930’s. It has been closed since October 2008. Now, the buildings are used for festivals, happenings, etc. 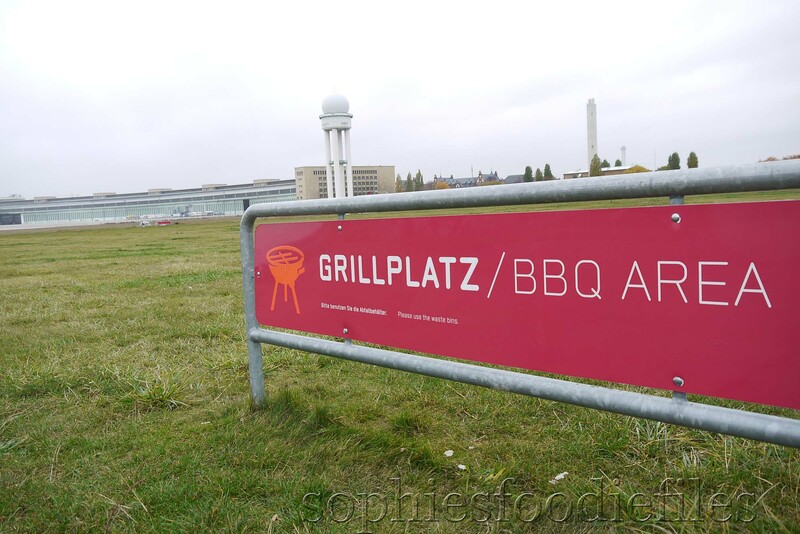 The outside & the airstrips are used by Berliners to skate, to walk, to cycle, to run, to BBQ, to play outdoor games, to kite, to flyboard. 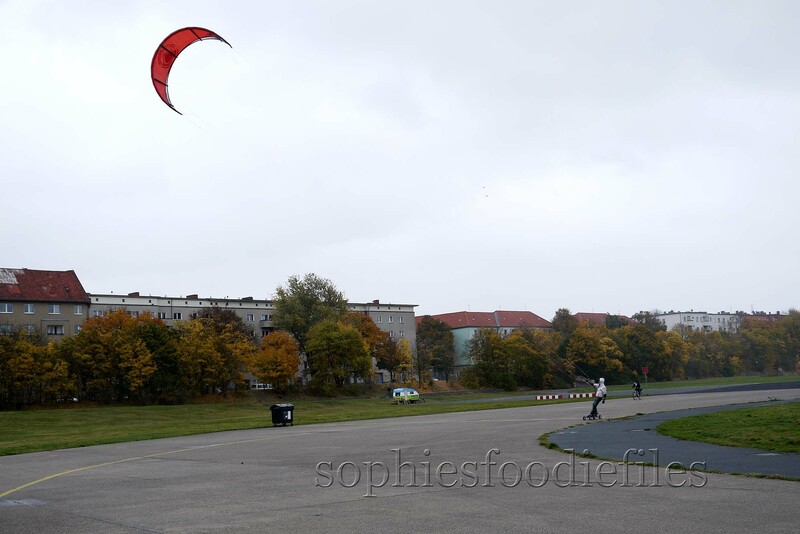 We walked on one side of Tempelhof & liked it. There was also a lot of green & not only macadam. A few people made little city gardens. A very sportive man who is flyboarding! Suddenly, it started to rain & we ran to the nearest exit. We arrived in a lovely neighbourhood. We are now in the area of Neukölln. Gladly, we found directly a cosy café. Café Engels, Herrfurthstrasse 21, 12049 Berlin. They don’t have a website. We were very happy. You could eat Kuchen too! You can eat more tasty foods here, like great breakfasts, pastas, salads,etc. 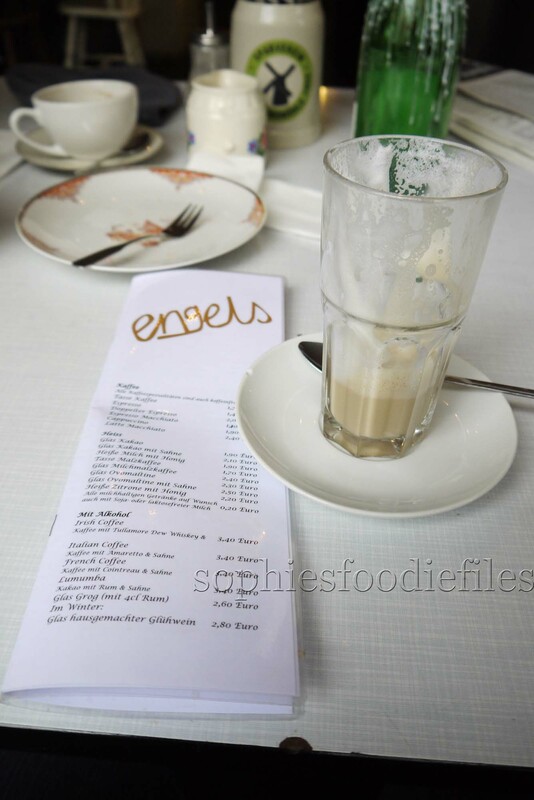 The interior of Café Engels! With candle lights on each table! I drank a caffé latte with lactose-free milk. I am lactose-intolerant, if you didn’t know. You could also choose a caffé latte made with soy milk, to make it vegan, if you wanted too. Peter drank a café & had kuchen with it. You could choose between 9 different kuchen! A few were vegan! You could choose between 9 different cakes! He chose a lighter cake with a rose & berry filling. It was dusted with icing-sugar. He loved it too! Peter’s lighter cake filled with a rose & berry filling! We payed 7€ in total. Later on, when the raining stopped, we walked a long time through this neighbourhood. It was the neighbourhood of Neukölln. A lot of people who live here are Arab or Turkish. The we took the U-bahn back to our hotel because we had to make us ready to go to a vegan restaurant in the evening. I had arranged to meet a fellow blogger, Justin from the beautiful vegan blog: Lotus & Artichoke. 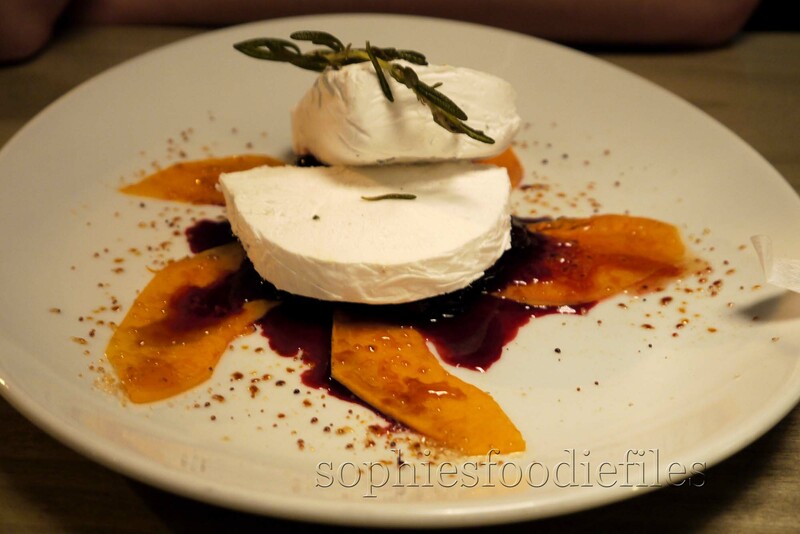 We met at the top vegan restaurant of the moment, in Berlin. 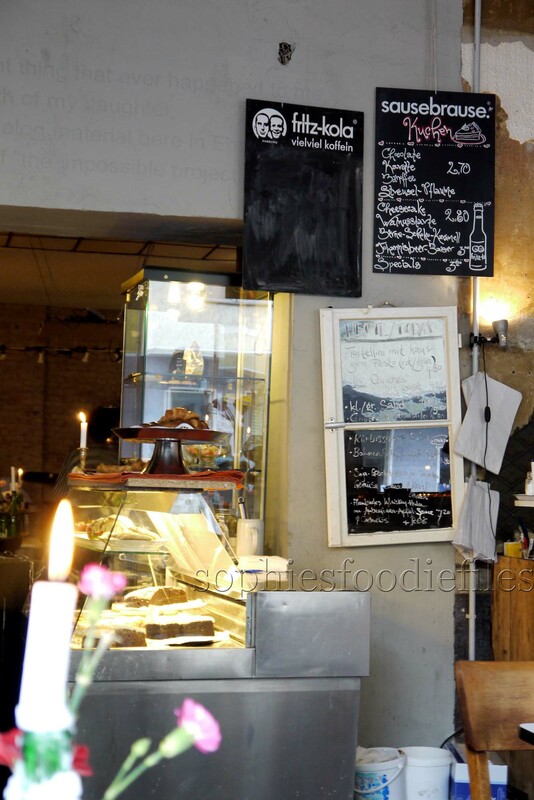 Kopp’s bar & restaurant, Linienstrasse 94, 10115 Berlin, 0049/30.432.097.75. Nearest U-Bahn: Rosenthaler Platz! You must book in advance! I met Justin & his girlfriend & they met us, Peter & Sophie. We had a lovely evening enjoying each other’s company & some good decent vegan foods.In Belgium we don’t have any vegan restaurant’s so it was very exciting for us to dine this way. 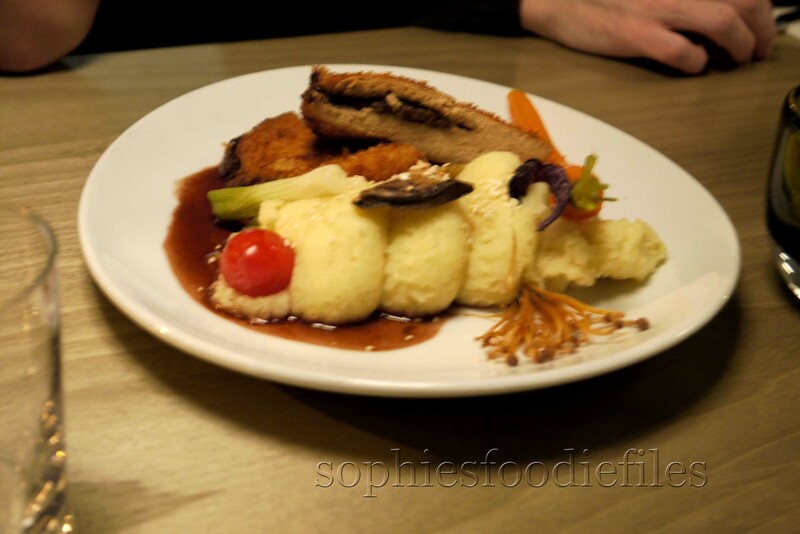 Kopp’s is famous for their interpretation of German cuisine. They work seasonal, fresh & with healthy ingredients that they found regional. So, after reading this on their website, I was very curious. Peter too. Justin eats vegan but he never visited this restaurant before. You could choose the evenings-menu. 4 rounds: 32€, 3 rounds: 25€, 2 rounds: 18€. That’s isn’t expensive at all, for Belgian standards. My fellow blogger wasn’t that hungry so we opted all for a main course & a dessert. My husband Peter drank the apéritif of the day & it was something alcoholic with a pear juice in it. He loved it. I drank a lovely red Merlot wine. The interior was not very stylish, more sober. I thought it was going to be a fabulously rich & chique decor but it wasn’t that at all. If you look at the website , you think: Waw & when you come inside the restaurant, you think that the decor is a bit poor. It looks more like an eating café. Other people weren’t dressed up at all! My new friends & Peter liked the decor. As main course, I choose the: Estragon quinoa risotto mit Schwarwurzl und haselnuss ( 11.09€ ). Translated means a tarragon quinoa risotto with salsify & hazelnuts. I gave this main course a 7/10. 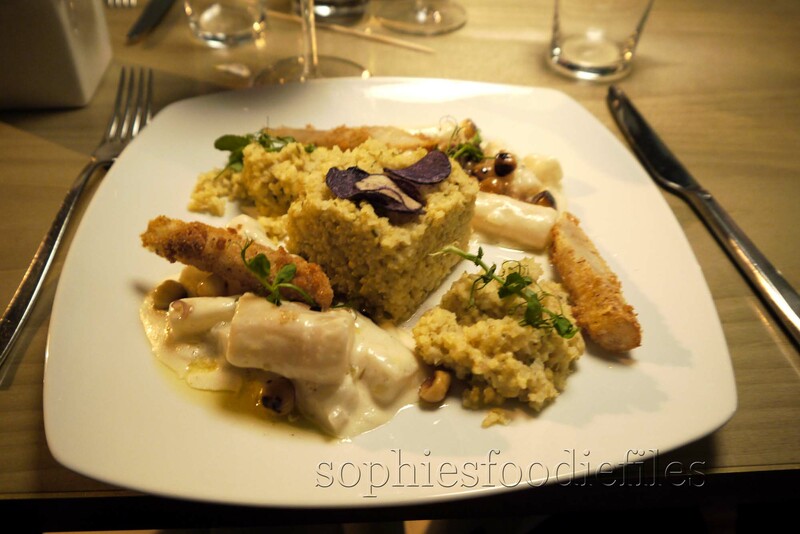 My dish: tarragon quinoa risotto with salsify & hazelnuts! My dish arrived & I thought this isn’t a risotto at all. I was a bit disappointed. It looked more & tasted more like quinoa had been cooked in a vegetable broth & that’s it. The panko encrusted salsify was so delicious & also the normally cooked salsify: so soft & yummy. It was in a delicious low-calorie plant-based sauce, which one, I couldn’t tell you. So good though. The caramelized hazelnuts were so tasty. Overall it was a very tasty dish but way too much quinoa for 1 normal person like me! The quinoa was a bit dry too. 😦 Justin’s girlfriend also toke the same dish & loved it. Peter took this dish. Krautwickel von Wirsing und Grünkern, ann kartoffel mit Süssbirne & Preiselbeere, dazu Kümmel Jus. 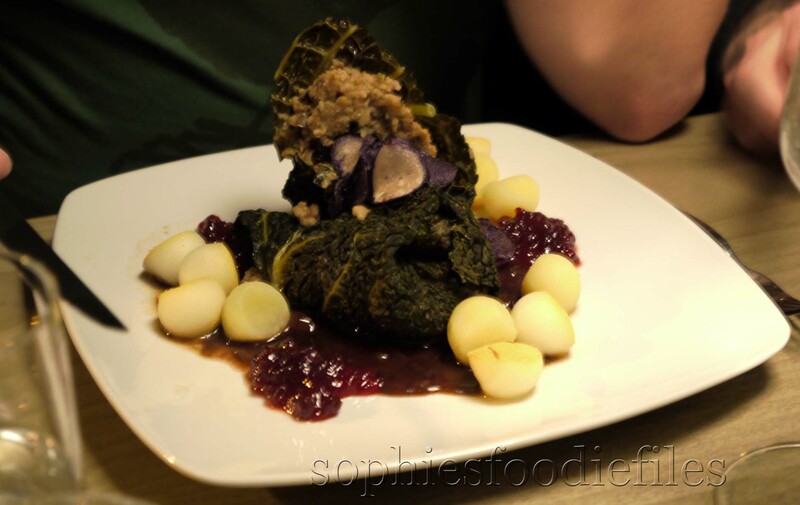 ( 14.90€ ) Translated: This was a sort of green cabbage leaves stuffed with vegan goodness, on a sauce of red berries & cooked mini potatoes, with a caraway jus. He gave his main course a 10/10! Justin took this tasty dish.Cordon bleu mit gekräuterten Pilzen gefülltes Filet an Erdafelpüree. Translated: A sort of vegan cordon bleu filled with seasoned mushrooms & seitan? on potato mash. (15.5€ )I tasted a big bite & it was very tasty & fab. The structure of the cordon bleu just looked like the real thing, very meaty like. He loved his dish too! Then, finally, the desserts! This tasty one, is Peter’s! He savoured: Gebranntes Carpaccio von Muskat Kürbiss, mit eine Rosmarin Parfait, dazu Schwarze Johannesbeere. Translated: A carpaccio from Musk pumpkin with a rosemary parfait with black berries. ( 5.9€ ) Peter loved his tasty dish. The rosemary parfait was lightly perfumed with rosemary. So delish! I tasted a spoonful & loved it too. The carpaccio was very thin & so good! Just look for yourself. He gave this dessert: 10/10! I savoured this tasty dessert. Offener Blaumohn – Birnenstrudel mit schokoladeneis & Preiselbeere. 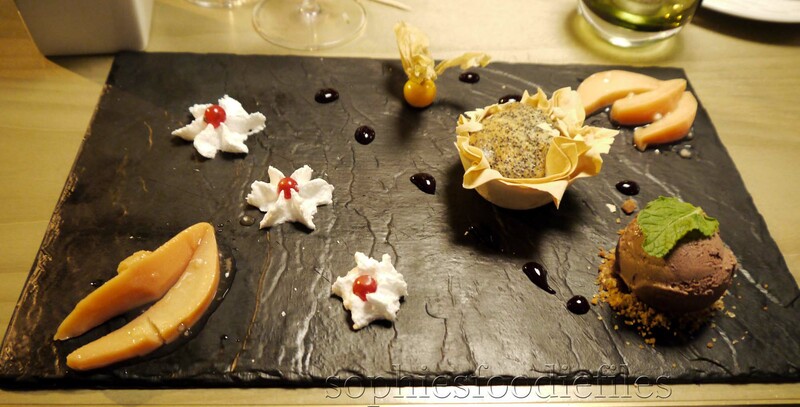 Translated: A sort of strudel with berries & poppy seeds with chocolate ice-cream & berries( 6.9€ ). This was not at all a vegan strudel. I was a bit disappointed because it wasn’t a strudel at all. But is was okay. The chocolate ice-cream was so good, the poppy-seed muffin was a bit dry & the peach & the mango slices weren’t so ripe. They were covered with agave. The crumble under the chocolate ice-cream tasted like vegan speculaas. The vegan crème fraîche was tasty. I gave this dessert: 7/10! So, it was a lovely 1st vegan experience dining & wining vegan style! 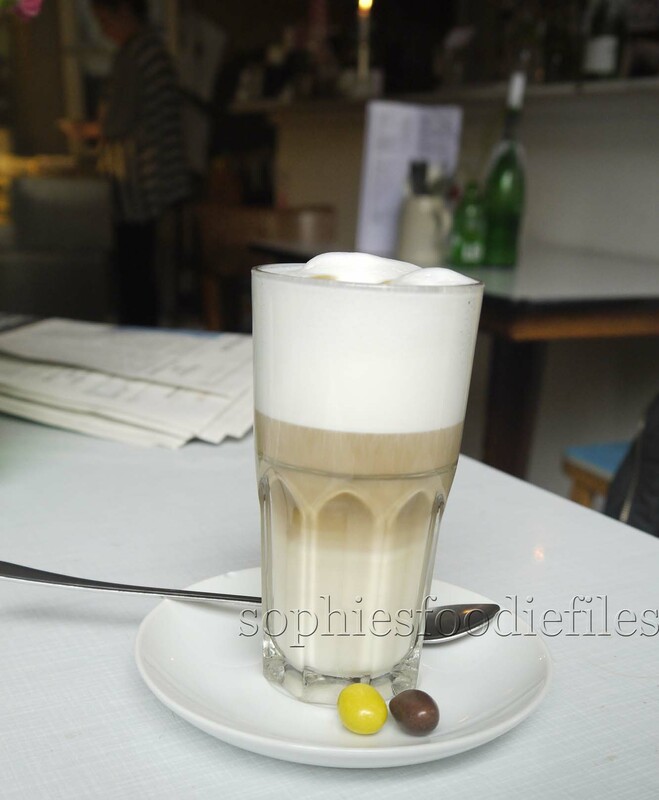 I hope you enjoyed reading Sophie travelling: Berlin part 3! 1. Sophie travelling: Berlin part 1! 2. Sophie travelling: Berlin part 2! 3. Travelling Sophie: Berlin part 4! Previous Post Travelling Sophie: Berlin part 2! 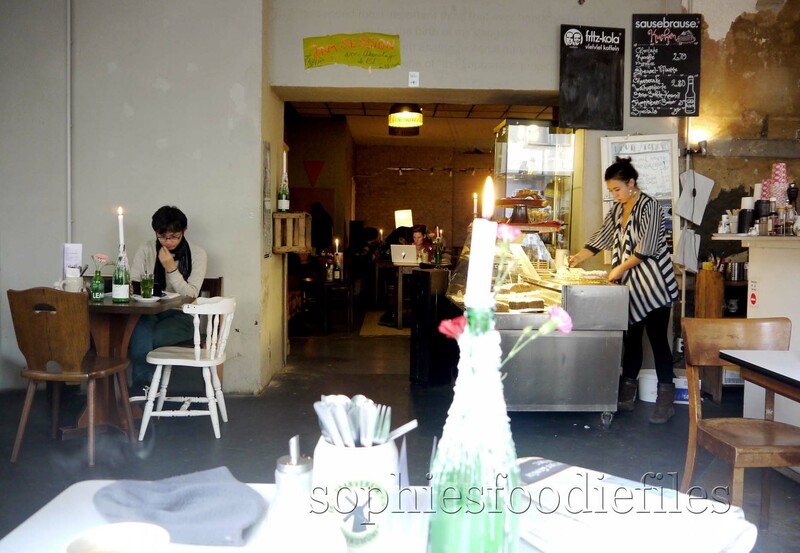 Next Post Travelling Sophie: Berlin part 4! All vegan! Another lovely review! What an interesting vegan meal. What a treat that there are vegan options in Berlin, and that you got to meet up with a fellow blogger! I think it’s so cool that the airport is now a sort of park! Thanks, dear Koko! 🙂 It was kind of cool to meet another fellow blogger that you never have seen before! 😉 Glad you loved it! Good honest review. Lovely that what would have been a waste land is now a park for all to enjoy. Thanks, Norma! 🙂 It was my 1st restaurant review. Tempelhof is pretty cool, I agree! What an adventure you’ve been on, Sophie! Interesting that there were so many vegan options! I enjoyed your posts about Berlin. As many times as I have been to Germany, I have never been to Berlin. Admiring your Berlin pictures I’m getting in the mood to have vegan food mysel! That’s true! 🙂 You are welcome! Sounds like an amazing holiday for you Sophie! Oooh….lots of nice food there….yum. But I’m really impressed by the lactose free latte. Would really love to try that one day. Thanks very much for sharing. You could find this lactose-free milk nearly in every café or food bar. It did cost you extra: 30 Eurocents though! But you had a choice! 🙂 It was a trend there. You don’t see that often here in Belgium! Great sharing Sophie. I really like your photos and your descriptions of the food. Such lovely food! 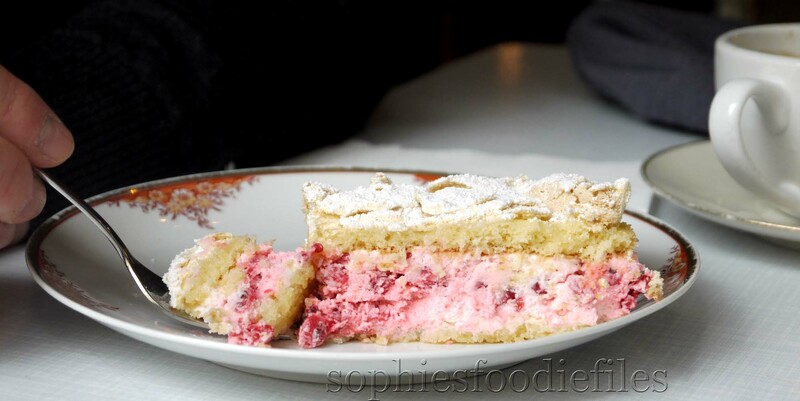 I would love to try that cake with rose and berry filling – sounds delicious! You can! 🙂 I am happy that you loved it too! Sophie that dessert of your husbands caught my eye. Looks like some great food you all had while visiting. I wish I could come on your food travels too. It was lovely! Thanks so much, Suzanne!